Silverfish are common to this area. They are primitive wingless insects commonly referred to as the walking fossils of the insect world. 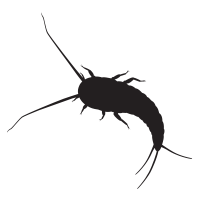 Silverfish are nocturnal, commonly found in side buildings or trapped in a basin or in the bath. Commonly described as secretive insects, they are difficult to find. Swift movers, they quickly migrate throughout a building via wall voids and pipe runs looking for food. Once they have located a suitable food source, they tend to remain close to that source. They have a preference for darkness and starches are their favourite food. This preference may include various glues and pastes, paper products and fabrics, even cereals and flour products. As a result books and book bindings, wallpapers, fabrics, photographs and paper products can incur significant damage. There is no doubt silverfish are tough creatures, but they do have a particular weakness which can potentially lead to their downfall. Silverfish prefer moist and humid conditions. Until this is addressed, complete control is unlikely to be achieved. DIY using over the counter products to achieve any control is near impossible. Whilst we don’t guarantee results overnight, our customised approach and expertise will implement specifically designed long-term multi-targeted treatments that aim to disrupt their daily activities. If your home already hosts a silverfish population contact us at Natures Way.